If you are looking for a delicious restaurant in Kansas City for date night or the family, Great Plains Cattle Co. at Ameristar Casino Hotel is the place to go! 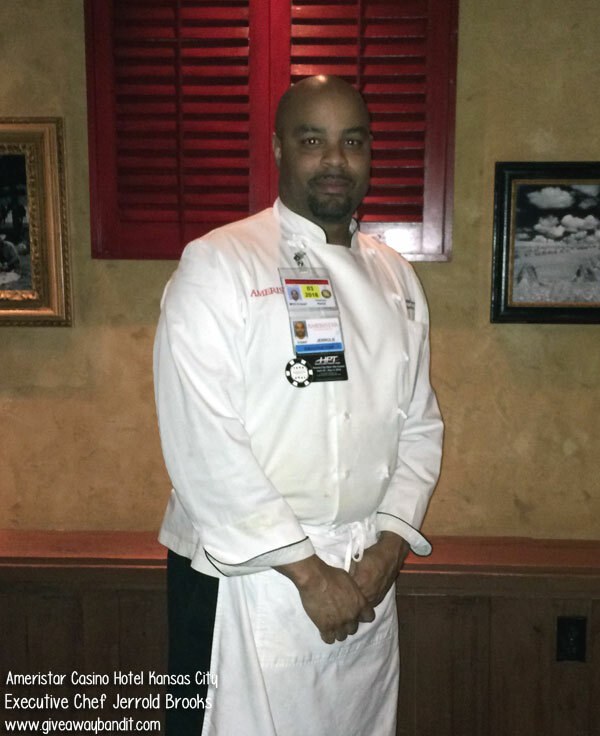 My husband and I were treated to an amazing meal seated with Ameristar’s executive chef, Jerrold Brooks, in a private dining room. It was an amazing and unique opportunity. Upon arrival you’ll be greeted with an American West theme with fireplaces, weathered crossbeams from old barn timber and wagon-wheel style chandeliers. One of my favorite parts of the night was getting to sit with the executive chef, Jerrold, and see how passionate he is with his work and food. Guests can elect from a variety on the menu including fish, seafood, steak, chicken, soups and salads. Look through our slideshow below of all these amazing dishes! It’s hard to pick one favorite. They were all so delicious! I would highly recommend ordering any of them! My sister is very health conscious. She eats only organic, gluten-free, etc. She was just telling me a few days before I went to Great Plains about how much better it is to eat bison than beef. I was completely sold on it after tasting the Buffalo (bison) rib eye. It was so delicious and MUCH more tender than I imagined it to be. I highly recommend trying it! Apparently bison has much less calories and fat than beef. Who knew, right? I’m not going to act like I’m a food critique because I’m not. What I can say is that the dining experience and food is exceptional. I would go here for a date night with my husband or bring my family to Great Plains for supper and finish with a movie in Ameristar’s theater. Of course, we’d stay the night in Ameristar’s hotel! Giveaway Bandit gives the Great Plains Cattle Co. FIVE Moustaches! Great Plains is our favorite restaurant in Kansas City. Give it a try. I’m sure it will top your list too! Make a Great Plains Cattle Co reservation online. You can also preview the Great Plains Cattle Co. menu online.